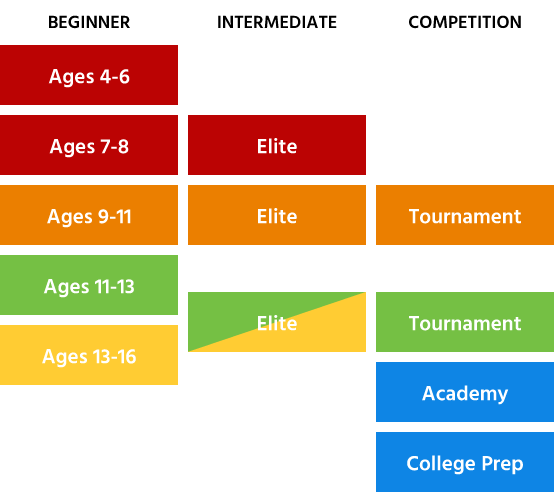 Yellow Level is for players who are in high school (13-16 years old) or players who have mastered the Green Level Competencies as determined by the coaching staff. Players learn on a full sized court with yellow balls and a 27″(adult sized) racquet. Classes meet once or twice a week. No more than 8 players per instructor. The emphasis is on court movement, basic stroke technique and match play. The program includes a once-a-week class, match practice on Sunday afternoons at 3:00 pm during the school year. We have Yellow Level and Green/Yellow Elite. Elite is by invitation only. Weekly Classes taught Tuesday/Wednesday/Thursday 5:30-6:30pm and Saturdays at 10:30-11:30 am during the school year. Players attend once or twice a week. FREE Match Day every Sunday at 3:00 pm. Tuesday/Wednesday/Thursday 5:30-7:00pm and Saturdays at 10:30-12 noon. Summer Camps are available for both levels every week throughout the summer Monday-Friday from 9 am – 12 noon. Summer classes are taught Tuesdays/Thursdays at 6 pm or Saturday mornings.